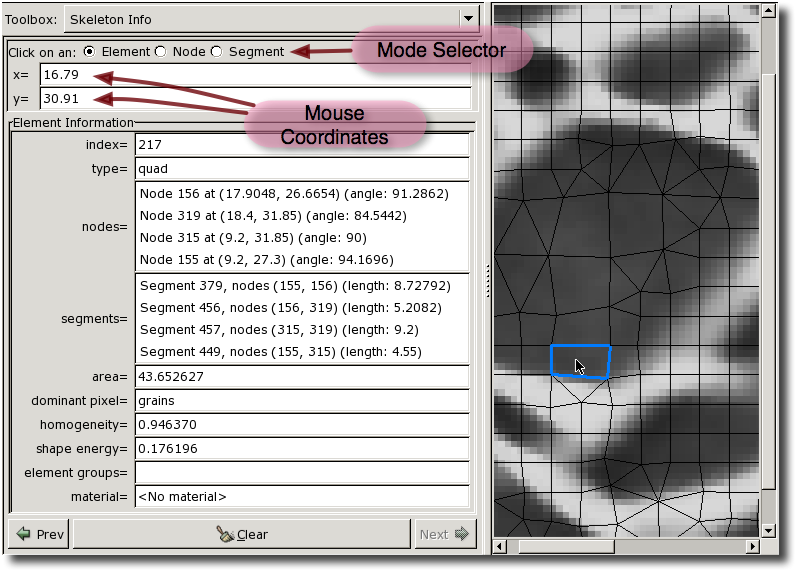 When the Skeleton Info toolbox, shown in Figure 4.10, is active, clicking the mouse on a Skeleton on the Canvas displays information about Elements, Nodes, and Segments in the Toolbox. Whether the Toolbox displays Element, Node, or Segment, information is governed by the setting of the Mode Selector buttons at the top of the Toolbox. In all three modes, the position of the mouse click, in physical coordinates is printed below the Mode Selector. The Skeleton Info Toolbox and the Canvas, while querying an Element. The window has been resized to show the entire Toolbox, which would otherwise need to be scrolled to be seen. In all three modes, the queried Skeleton component is highlighted in the Canvas. The Clear button at the bottom of the Toolbox erases the highlighting and clears the data listing. The Prev and Next buttons on either side cycle through the previously selected objects (changing the Toolbox mode, if necessary). The Element's index. This is just an integer used to identify the Element. All of the Elements in a Skeleton have a unique index. When a Skeleton is modifed, the indices of all Elements may be changed. The Element's type, indicating its topology. A list of the Element's Nodes. Nodes are listed in counterclockwise order with an arbitrary starting point. Each Node's index, position (in physical coordinates), and interior angle (in degrees) are listed. Clicking on a Node in the list will highlight it with an pink dot on the Canvas. Double-clicking on a Node in the list will switch the Toolbox into Node Mode and display information for the chosen Node. A list of the Element's Segments, including the Segment's index, the indices of the Nodes at its endpoints, and its length (in physical units). Clicking on a Segment in the list will highlight it with a thick pink line on the Canvas. Double-clicking on a Segment in the list will switch the Toolbox into Segment Mode and display information for the chosen Segment. The area of the Element, in physical units. The dominant pixel of the Element. This is a list of the pixel groups to which the pixels comprising most of the Element belong. The Element groups to which the Element belongs. The Material assigned to the Element. This is the Material that will be used for any Mesh elements that are created from this Skeleton. It is the same as the Material assiged to the Element's dominant pixel, unless that choice has been overridden by assigning a Material to an ElementGroup containing the Element. The Node's index. Like the Element index, this is just an integer used to identify the Node. When a Skeleton is modified, Nodes may get new indices. The position of the Node, in physical units. The mobility of the Node. Nodes that are pinned are marked as such. Nodes that are constrained to lie on the boundaries of the Microstructure are marked as “x only” or “y only” if they can move in the x or y directions, and as “fixed” if they cannot move at all. Nodes with none of these constraints are marked “free”. A list of the Elements which surround the Node, in no particular order. The index of each Element is given. Clicking on an Element in the list highlights that Element's perimeter in pink in the Canvas. Double-clicking will switch the Toolbox to Element Mode and display the information for the chosen Element. The Node groups to which the Node belongs. The point boundaries of which the Node is a component. The index of the Segment. Like the Node and Element indices, this is just an integer identifier. When a Skeleton is modified, Segment indices may change. The Nodes at the ends of the Segment. The index and position (in physical coordinates) of each Node is listed. Clicking on a Node in the list highlights it with a pink dot in the Canvas. Double-clicking switches the Toolbox to Node Mode and displays the information for the chosen Node. The Elements to which the Segment belongs. The index of each Element is given. The length of the Segment in physical units. Any Segment groups to which the Segment belongs. Any edge boundaries of which the Segment is a component. The color and size of the markings used to highlight the queried Elements, Nodes, and Segments may be changed by editing the SkeletonInfoDisplay display Layer. This Layer is predefined and always displays the topmost Skeleton. It will be necessary to enable List All Layers in the Settings menu in order to edit the Layer.